FiveThirtyEight launched its 2018 House Forecast late last week. There are three versions of the model, described more fully in this overview of the model methodology. An interactive map of the 'Classic' version of the forecast is below. At a high level, this version couples available polling with numerous fundamental factors to derive a probability of victory for the individual candidates in each race. We group those probabilities as FiveThirtyEight does, so that our map is consistent* with theirs. Click or tap the map to view the ranges and to use it as a starting point for your own 2018 House forecast. * We hope to update the interactive map daily. As the FiveThirtyEight model runs "every time new data is available", there will occasionally be differences between the two. See the timestamp below the map for the date and time of the last update. Rep. Duncan Hunter of California was indicted Tuesday and charged with the illegal use of campaign funds over a seven year period. House Speaker Paul Ryan indicated Hunter would be removed from his committee assignments until the matter is resolved. Hunter is in his fifth term representing a conservative San Diego-area district that supported Donald Trump by 15% in the 2016 election. Only seven of the state's 53 congressional districts voted for the president over Hillary Clinton that year. Hunter was renominated in California's top-two primary in June. Even if he were to decide not to run, there is no good mechanism to remove his name from the November ballot. Additionally, California does not allow for write-in candidates. Alaska and Wyoming hold primaries on Tuesday. Polls close at 7:00 PM Mountain Time (9:00 PM Eastern) in Wyoming, with Alaska polls following at 8:00 PM local time (midnight Eastern for most of the state). Wyoming has a Senate election, while both states have primaries for gubernatorial elections and their single, at-large congressional district. Mostly Useless Trivia: Alaska and Wyoming are the largest and 3rd largest states by area, and thus their single congressional districts are two of the three largest in the country. The combined area of these two districts is about 669,000 sq. miles. This is larger than the combined land area of the smallest 334* districts. An overview of the races follows. Live results will be available after the polls close; reload this page for the latest. Live there and not sure where to vote? Look up your polling place. Incumbent Gov. Matt Mead cannot run for a third term. The GOP primary looks like the most interesting race of the day here, both for its competitiveness and the fact that the winner will almost certainly be the next governor of this deep red state. There are six candidates on the ballot. Limited polling indicates a tight three-way race between Wyoming State Treasurer Mark Gordon, Businessman Foster Friess and attorney Harriet Hageman, all near 20%. Two other candidates, Sam Galeotos and Taylor Haynes are closer to 10%. On Election Day, President Trump tweeted an endorsement of Friess. Republican Sen. John Barrasso is seeking a third term in 2018. Barrasso is being challenged by a political newcomer, businessman Dave Dodson who has been able to self-fund to get his message out. Another candidate, former Catholic priest Charlie Hardy, dropped out Monday and endorsed Dodson. There's no polling here, so it is unclear how much of a threat Dodson is to the incumbent. Assuming Barrasso prevails, he'll be a heavy favorite against Gary Trauner in November. Trauner is unopposed for the Democratic nomination. Should there be an upset, the race could be a little more interesting. As the AP notes, "Wyoming hasn't had a Democratic U.S. representative since 1978, but Trauner came within half a percentage point of beating Republican Rep. Barbara Cubin in 2006." Republican Liz Cheney is expected to win today and in November. The state's independent Gov. Bill Walker is not on the ballot today. His path to reelection has been complicated by the last-minute entry of former Sen. Mark Begich into the Democratic primary. Former State Sen. Mike Dunleavy is expected to win the Republican nomination. This will set up a competitive three-way battle for governor in November; several polls conducted in June gave Dunleavy a small lead. Incumbent Don Young - the longest-serving current member of the House - will be seeking a 24th term this November. Democrats are expected to nominate either Alyse Galvin or Dimitri Shein. Galvin is actually an independent who is able to run in the Democratic primary due to a court ruling earlier this year. (A third Democrat, Carol Hafner, has never been to the state.) Regardless of who emerges, Young will be favored for reelection. * Based on current Pennsylvania district boundaries, which will change as of January, 2019. This might change the number slightly. There are 80 days until the November 6th midterm elections. 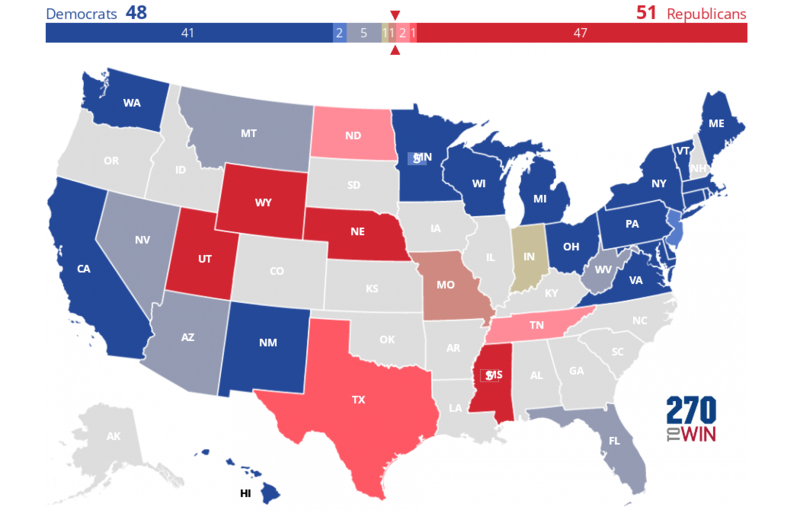 On this page, we present two battleground House maps based on the current ratings of Sabato's Crystal Ball, The Cook Political Report, and Inside Elections. 218 seats are needed to control the House in the 116th Congress that will be seated in January, 2019. Consensus Forecast: This first map is based on a calculated average rating of the three forecasters except that the darkest red/blue color is only used for those districts rated safe by all three forecasters. This gives us a broader view of the universe of seats that may be competitive on Election Day. Currently, 321 seats are seen as safe for the incumbent party, with 114 having various levels of competitiveness. Of those, about 95 are currently in GOP hands. Most Competitive: This next map categorizes a district as competitive if at least one of the three forecasters gives it a rating of toss-up, tilt, or leans. It is a broader view of the more competitive races than one would get by looking at a single forecast. Absent a real wave election, these are the seats where control is likely to be won or lost. Republicans hold 60 of these 70 districts. Note that the above narrative is as of August 17th. As the forecasts evolve in the months ahead, the images in this article will update to reflect the then-current outlook. Before we dive into this week's primaries, an update from last week. On Tuesday, Kansas Gov. Jeff Colyer conceded the GOP primary to Secretary of State Kris Kobach. This sets up a general election race between Kobach, Democrat Laura Kelly and independent Greg Orman. Colyer is the first governor to lose a bid for renomination this year. Four states held primaries on Tuesday. All results can be found via the links above. A recap of each primary follows. In the race to replace retiring Gov. Mark Dayton, limited polling hinted at one outcome, but the voters went in a different direction. Former Gov. Tim Pawlenty lost the GOP primary to County Commissioner Jeff Johnson. Pawlenty has been a critic of President Trump, a positioning that has not worked out well for many Republicans in primaries thus far in 2018. On the Democratic side, Rep. Tim Walz (MN-01) won a three-way race against Erin Murphy and Lori Swanson. Rep. Rick Nolan (MN-08) ran as Swanson's running mate. He becomes the 7th current member of the House to lose an election for another office in 2018. This result shifts the general election outlook slightly in the Democrats favor. No surprises in the Senate primaries, as incumbent Democratic Senators Amy Klobuchar and Tina Smith easily won their races. They are both likely to hold their seats in November. Rep. Keith Ellison won his primary to become Minnesota's Attorney General, overcoming - for now - recent allegations of domestic violence. Ilhan Omar won the Democratic primary in Ellison's 5th district, and should coast to victory in this deep blue district. Omar will become the first Somali American elected to Congress. Gov. Scott Walker was easily renominated for a third term. He'll meet the state's education chief, Democrat Tony Evers in November. Evers emerged from a field of eight candidates to win the nomination. The general election should be highly competitive. State Sen. Leah Vukmir got by Kevin Nicholson for the GOP U.S. Senate nomination. She will face Democratic Sen. Tammy Baldwin in November. Baldwin is favored to win a 2nd term. Speaker Paul Ryan endorsed his former aide, Bryan Steil to replace him in the state's first congressional district. Steil easily won the GOP primary. He'll meet Randy Bryce, aka 'Iron Stache' who defeated Cathy Myers for the Democratic nomination. Democrat Ned Lamont and Republican Bob Stefanowski won their respective party nominations to replace termed-out Gov. Dannel Malloy. Stefanowski's win was a bit of an upset, as he bested the party-endorsed candidate, Danbury Mayor Mark Boughton. Matthew Corey won the Republican U.S. Senate nomination. He faces long odds against incumbent Democratic Sen. Chris Murphy. Gov. Phil Scott was renominated, fending off a challenge from the right that arose after Scott signed gun control legislation earlier this year. On the Democratic side, Christine Hallquist was victorious; she will attempt to become the first transgender governor in U.S. history. Scott is strongly favored to win a 2nd two-year term. Sen. Bernie Sanders easily won the Democratic nomination, which he is expected to decline to run as an independent. Separately, Sanders told Stephen Colbert on Tuesday that he had not ruled out another presidential bid in 2020. The Republican nomination was not decided as of this writing, but it is of little consequence as Sanders is an overwhelming favorite to win a third term this fall. Voters go to the polls in four states Tuesday. 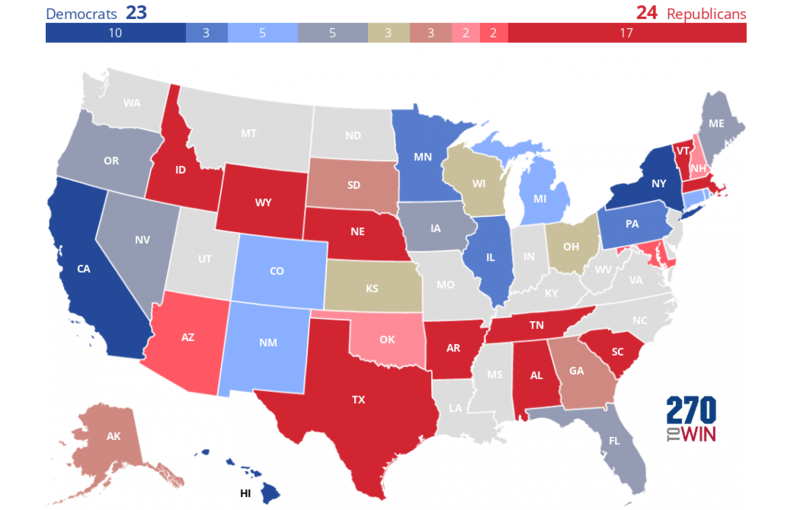 Select a state for an overview of key races. After the polls close, those same pages will have live results from all contested House, Senate and gubernatorial primaries. Hawaii holds its primaries on Saturday. The state elects a Senator, governor and representatives from both congressional districts in 2018. Democrats are expected to retain control of all of these seats. The most notable primary races are for the Democratic nomination for governor and in the first congressional district. Polls close at 6:00 PM local time, which is midnight Eastern. Reload this page after that time for the latest results. Gov. David Ige defeated then Gov. Neil Abercrombie in the 2014 Democratic primary, going on to win the general election by 12 points. Ige himself now faces a serious primary challenge from Rep. Colleen Hanabusa (HI-01). For much of the year, it has looked like Ige would meet the same fate as his predecessor. Polls this spring had him down by double-digits to Hanabusa, as voters were not impressed by Ige's slow response to the false missile alert from this past January. However, Ige's handling of real disasters - Kauai flooding and the kilauea volcano have turned his fortunes around, and Ige goes into the primary with the lead in recent polling. Either Democrat will be favored in the general election. The leading Republican appears to be Andria Tupola, who is the Minority Leader of the Hawaii House of Representatives. Incumbent Sen. Mazie Hirono is running unopposed. She is expected to win a 2nd term in November. Hanabusa is giving up her Honolulu-area seat to run for governor. This Washington Post article provides an overview of many of the Democratic primary candidates looking to replace her in Congress. Rep. Tulsi Gabbard is likely to advance to the general election in the 2nd district, although she does have some detractors. Both seats are considered safe for Democrats in the fall. The too close to call Kansas GOP gubernatorial primary got even closer Thursday afternoon. Secretary of State Kris Kobach's lead over Gov. Jeff Colyer shrunk to 91 votes, as a 100 vote miscount was discovered in Thomas County. Out of over 311,000 votes counted thus far, that's a difference of about 0.03% between the two candidates. Provisional and mail-in ballots still need to be counted. If the final margin is less than 0.5%, which looks like will be the case here, a recount can be requested. The 'tilt' rating is now available on the House interactive map. The option had previously been added to the Senate and gubernatorial maps. There are now four ratings (safe, likely, leans, tilt) available for each party, as well as toss-up. Use the color palette to the right of the map to choose how many of those you want to rotate through on your map. Alternately, you can choose an individual rating to update multiple states/districts with a single click each. See our overview of the color palette options. The tilt rating sits between toss-up and leans. The forecaster Inside Elections uses this designation for races that are highly competitive, but where one party has a slight edge. The maps below reflect their current 2018 projections. Select any of them to create and share your own 2018 forecast. Federal prosecutors indicted Rep. Christopher Collins on Wednesday, charging the third term Republican with securities fraud, wire fraud and making false statements. The charges relate to insider trading associated with a biotech firm. Collins represents New York's 27th congressional district, a conservative district between Buffalo and Rochester. Collins won reelection by 34% in 2016, and was unopposed in the state's primary in late June. Sabato's Crystal Ball has modified its 2018 election rating from safe to likely Republican on news of the indictment. Gonna move Collins' seat from Safe R to Likely R following news of his arrest. NY-27 (western NY) very tough seat (Trump +25) but Kathy Hochul almost held it against Collins in 2012 and Collins now has some... issues.